Today, we’re excited to announce the Logitech Wireless Solar Keyboard K760, the latest addition to our popular line of solar keyboards. Following our full-sized Wireless Solar Keyboard K750 for PC or Mac, and our recently announced Logitech Solar Keyboard Folio for iPad, the new Logitech Wireless Solar Keyboard K760 is the perfect companion to all your Apple devices, whether Mac, iPad or iPhone. When we released the Logitech Wireless Solar Keyboard K750 for the Mac last fall, some customers let us know they wanted a solar keyboard that used a Bluetooth wireless connection. Well, we listened. Three different devices can be kept paired via the easy-switching Bluetooth connection. You can quickly and easily switch from your Mac to your iPad with the press of a button. Switching back is just as easy. This has really come in handy for me as I go from the Mac on my desktop to my iPad for meetings. 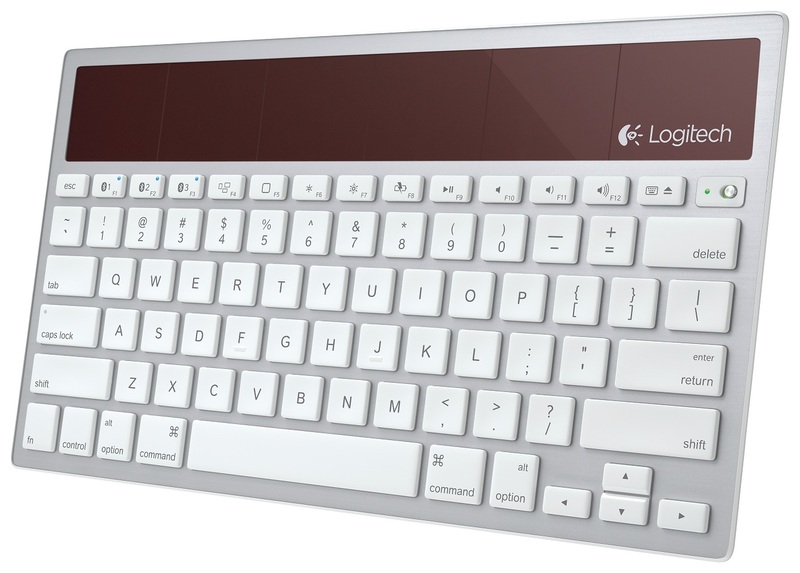 The Logitech Wireless Solar Keyboard K760 is specifically designed for all your Apple products. It has Command, Eject, Brightness and Volume keys just where you’d expect them. And the dedicated Home key works just the same as the built-in Home button on your iPad or iPhone. Like our other solar keyboards, the onboard cells are charged by any light, indoors or out. Never bother with carrying an extra charging cord or replacing batteries. This is especially handy when using the keyboard on the go. Check out the video below to see this new keyboard in action, and let us know in the comments what you think. Will there be a Swedish/Finnish version of this keyboard available? Apart from my need of that particular keyboard layout this sounds like my dream keyboard! Will there be a full size version with a numeric keypad? We’re happy to hear your feedback! This is so cool…..Is this available in India? Srikar, currently It’s only available in the US and Europe. Hi, I’m assuming it can be paired with other bluetooth devices such as a Playstation 3? Or is it really only able to connect with Apple devices? Being able to switch the same keyboard between my iMac, PS3 and iPhone would be stellar! Hi Erik, the keyboard is not currently compatible with the Playstation 3. This will be compatible with Android? And with Windows? Will you release a edition with numeric keys? This will be avalible in Brazil? Thanks! Unfortunately, the K760 is only compatible with Mac, iPad and iPhone. You will also need Mac OS X 10.5 (Leopard) or later. Sorry, no Windows. Is there a case available for traveling with it? This is great, now how about a black non bluetooth Windows version that supports Unifying in this same exact size? I was on the fence of purchasing a K750 to use in combination with my M705 but since it was going to be used at work and im always on the move i couldn’t be bothered with the size of it. Personally, i use a K800 and Performance Mouse MX at home, love them :). These are all great suggestions. Thanks for the feedback, we will be sure to pass them along to our team. I just don’t get it. You make a solar keyboard for the PC, you make a solar keyboard for the mac, now you make a solar keyboard for the mac/iPad. Why not ADD PC compatibility? There is not enough room on the desk for a PC keyboard and a mac/iPad keyboard. I use the Microsoft wireless keyboard 800 – cause it works with both PC/Mac. I’m just going to order a solar panel from Amazon and attach it so I can finally go solar. We appreciate your feedback and will be more than happy to pass it on to our team. We sincerely apologize for the delayed response, Erik. The K760 is not compatible with Playstation 3. It is dedicated & fully tested with Apple products: Mac, iPad & iPhone. Could it be possible if you make a wider version with a seperate numpad? Apple ditches the extra numerical keys but i love them for quick entering data. Thanks for your suggestion. We’ll pass on your feedback to our team. We’re sorry Dom, but the keyboard will only be shipping out in June 2012. Looks great! Will the pairings work with non-apple blutooth devices also? Hi, it only pairs with Apple products. We’re glad you think it looks great! We’re glad you think so Mark. Thanks for the feedback. Understand that it is not available in India right now, but is it possible to let us know when can it be made available in india? Thank you. Hi Sharbori, it should be available in the region soon. Please keep an eye on the website! Just got one. Nice and cool. But do you know what the shortcut keys for sending sms is? After editing a SMS on iPhone, I cannot simply press RETURN or other keys to send it. Any ideas? thx a lot. Keyboard looks amazing – do we have a definitive date for the new keyboard to hit the “digital shelves”? We’re glad you think so! The keyboard will be shipping out in June 2012. Hi! Looking for a keyboard for my ipad/itouch. Largely agree with having cross platform compatibility, that would be awesome. I’m curious though, what are the dimensions? I’m investigating getting this and a case/stand for this. My ipad already has a speck cover which I love but this would be a good addition if I can match it with something. I’m thinking the Incase Origami Workstation http://store.apple.com/ca/product/H6353ZM/A#tech-specs any thoughts/suggestions? ….and dimensions? please! Check out our Forums to read feedback and chat with loyal fans here: ttp://forums.logitech.com/. Thanks! uhh . . it is June. can you be more specific? We will keep you updated, Alan! Thank you. The K760 would be on my “must have” list, but not being able to use it in Windows is a dealbreaker. Truly, with Bootcamp as amazing as it is, it no longer makes sense for “Mac Only” input devices…Macs run Windows better than Windows PCs! The only reason one even NEEDS a “real” PC these days is for gaming. I have an iPhone, an iPad 3, a 27″ iMac and an 11″ MacBook Air (which I also use sometimes with Bootcamp/Windows 7), but I just don’t find the K760 keyboard a compelling purchase without Windows support for Bootcamp and my gaming PC. My 27″ iMac lives in Bootcamp mode 99% of the time so I can use my beloved Windows-only Input Director KVM software, which allows me to move instantly and seemlessly between my dual-monitor gaming PC and my iMac. Yes, there’s Synergy, but it isn’t even in the same ballpark; it doesn’t offer the Logitech compatibility that lets me use my G13, G19 and G700 with full functionality across both machines. Finally, is the keyboard plastic, or aluminum? For $79 I hope it’s not plastic. We appreciate your feedback and will pass your suggestion along to our team. The keyboard is made out of quality eco-friendly plastic that maintains a premium feel. Thanks! have the ipad keyboard and love it, but two keys came off. One snapped bcak on but not the other. How to put it back on? This keyboard is exactly what I have been looking for given that it pairs perfectly with my portable iOS devices. But I am surprised that it does not include a travel case as it just begs for one, ala the Logitech tablet keyboard and case for iPad. I visited the forum per your recommendation above and could find no suggestions regarding other cases. That’s a great suggestion! We’ll be sure to pass it along to our team. in the specs listed above you didn’t mention how much it weighs. Can you please provide the weight? Hi James, the Logitech Wireless Solar Keyboard K760 weighs 500g. Hi John, you may be able to find an answer by searching within our community forum. Here’s the link: http://forums.logitech.com/. If that doesn’t work, we suggest that you open up a case with us here: http://www.logitech.com/support. Hope this helps! I’m curious to know if there are any plans to make a version of the k760 with the numeric keypad (similar to your k750)? Most of the players I know recommend it. They both offer 88 key weighted hammer action keys. This is a lovely piece of kit. Such a shame though that a predominantly PC company like Logitech should make the most practical, and atractive keyboard in their range Mac only. What are you playing at guys! We need this for PC too! Hello and thanks for your feedback, Andy, we’ll be sure to pass it along. Please keep in mind that we enjoy making both Mac and PC products, so make sure to check back in the future! Love this keyboard. But really, no support for Bootcamp? Now I have to have two keyboards, which is ridiculous considering your pedigree. Can I return my K760 for a refund? Hey Andy, you can open a case with us here:http://logitech.com/support, and then send us your case # and an email so our customer care team can get in touch. I have searched for the answer to my one question and cannot find it anywhere online including here,…but just ‘When’ does this keyboard actually charge up,…..(?) Does it charge with the on-off button on,…or when it is off???? Please could someone answer me?? Sorry for the late response Gary. The keyboard will recharge regardless of whether the on/off switch is on/off. I just saw that those were being posted while I thought they were not,….and that I needed to moderate my question,…how crazy is that? Guess I will just have to wait until someone moderates ehhhh? You can refer to our website at logitech.com for announcements involving product releases. Not having great luck w/this keyboard. I turn my computer off each night, and the next morning — whether I have left the keyboard turned on or off — my MAC can’t find it, and I have to ‘discover’ it all over again. But even worse, I left my computer alone around noon today and didn’t return to it till about 5:30 PM this evening. And, my MAC couldn’t find the keyboard again! Why did the computer ‘lose’ it during the afternoon? Sorry for your troubles Cathy. Please open a case with us here: http://www.logitech.com/en-us/support. Once you’ve done that, private message us on our Facebook page https://www.facebook.com/Logitech with your case #, email address and location and we will do our best to help you out. I just want to add the K760 works perfectly with my Playstation 3 and under Windows 7, as I read a post saying no. Hi Oscar, do you have a specific question? Is the K760 compatible with an iPod? Hi Ellie, you can connect the K760 to your iPod. K760 works beautifully with my iPad, but is not discoverable by my iPod Touch. The UK tech support people told me the iPod Touch is not supported, but you said it is…so how do I get the connection, please? We apologize for the confusion. Tech support is correct. i know that in early june there was an inquiry about travel cases. any updates since then? i was unable to locate other user feedback regarding any solutions to this. do you recommend any aftermarket cases that would fit this keyboard? Hey — I love the new Logitech keyboard — except that it is not compatible with Microsoft Office 2008 when run on MAC-OS X. The arrow keys don’t work like normal to help you be able to switch between cells. Please advise. I’d love to see a similar keyboard for Windows. More specifically I was looking for a Logitech keyboard without numpad for Windows and strangely enough there are none available. We appreciate that feedback and will make sure to pass it along to our product team. I have paired my K760 to an Ipad 2, Ipad 1 and Google Nexus 7. Yes, it works fine with the Nexus 7 (I’m using the keyboard and a Nexus 7 now). Some Apple-specific buttons like brightness control, command and show on-screen keyboard don’t work. Escape key and volume up and down keys work great. This keyboard has a user replaceable re-chargeable battery (AAA size NiMH). So basically, unlike the Apple products, you can use this keyboard for life! We’re glad you like it! Thanks for your kind words. The old K750 keyboard was about 99% there — full-size, Mac layout, wireless, that cool-looking solar feature — but suffered from one fatal flaw; it required a receiver. Since a common problem with Apple design is that they often only give you two USB ports or so, not eating up half of your USB ports is a big reason to go wireless in the first place. I’m extremely pleased to see that Logitech’s latest solar Mac keyboard supports Bluetooth, but unfortunately, it appears to be available in a laptop size only, just like Apple’s Bluetooth keyboard. If Logitech were to offer a full-sized version of the K760 Bluetooth keyboard, I’d finally have a good replacement for my aging Apple 2005 Bluetooth keyboard, and I suspect many other people who do a lot of typing would appreciate the option as well. Please consider adding a full-size version of the K760 — if you do, I’ll buy it. Thanks for your suggestion Charles. We appreciate feedback from our customers and will pass your suggestion on to our team. Why can’t the device have support for windows 7? I bought this device expecting that it would be windows compatible, but it’s not and it’s giving me lots of headache when I boot windows through bootcamp. Please add windows support. I would greatly appreciate it. Other than windows support the device works fine except that the brightness adjustment keys don’t work on ipads. Hi James, we appreciate your thoughtful feedback and have passed along your suggestion. Thanks. Hello Logitech, have you passed along the suggestion of James? That will this ever have support for Windows 7 bootcamp or not? or you’ll pass this too along again. It’s just a simple a Yes or No question. Will this K760 will have an update in the (hopefully) near future to support windows 7 bootcamp or not? Which is which? I hope you’re answer will not be passing along anymore. Nothing will happen if you keep passing. Looking forward for the answer so I can pass along this keyboard back to bestbuy. Thanks. Hi Jim, we can’t comment on future updates at this point of time but we do make sure to pass on any customer suggestions and feedback to our team. I think this would be a perfect keyboard if it did have windows support cuz I bought this keyboard when I got sick of changing batteries on the keyboard from Apple. And seeing that no other keyboard out there has switchable bluetooth capability or solar power, this WOULD be a keyboard like no other. It kind of saddens me since it falls short of being so perfect. Thanks for letting us know what you think. We will pass on your message to our team. Apart from the U.S. English layout, in what other language layout(s) is this keyboard available? Apart from the U.S. English layout, in what other language layout(s) is this keyboard available. I’m writting it on K760 paired with Sony Tablet S. Sorry, Logitech, it IS comaptible with android!